They just keep biting me. No matter where we are or what we’re doing, bugs are after my apparently delicious flesh. I’ve always thought they knew I reacted worse than most to their bites. Mosquitoes, no-see-ems, they’re all bad. Swatting bugs on Hog island. 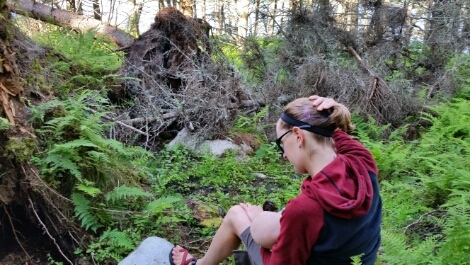 I started this trip with a good amount of bites from around Lee’s parents house but after a hike on Hog island our first day out I was in itchy hell. I even have hives all over my chest thanks to something I encountered on that island, bug or plant. Tonight, anchored at the pristine White islands, I don’t see any bugs but bites keep appearing. Ugh. Better me and not the baby I suppose. The sights on a glassy day. We tried to get to the White islands, a tiny archipelago of 4 off Vinalhaven, yesterday. 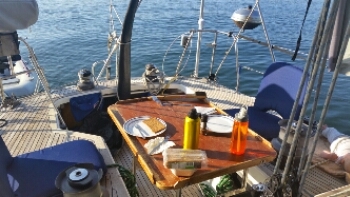 The light wind forced us to cut the passage short, however, and we stopped in Long Cove next to Tenants harbor for the night. Rain squalls complete with thunder and lightning blew through just after we anchored so I, at least, was glad to be in a safe harbor. Gunnar getting ready to go ashore. Lee and I took turns running around town in the morning. We were disappointed to find the source of fresh baked goods, seafood, and all kinds of boater services our guidebook told of closed for the season. 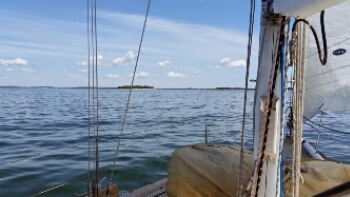 After jumping in the chilly water we took off across part of Penobscot Bay for the White Islands. Grilling at anchor among the White islands. Sorry no pictures of the scenery yet. I took those on the big camera and need to download them. The White Islands are made up of Big and Little White as well as Big and Little Garden Islands. Evergreens top their stony shores and the narrow passages between them make idyllic anchorages. There are 4 other boats in this intimate spot, a reminder that we’re out for Maine’s high season. Still, we are enjoying the view and plan to take the SUP for an spin in the morning as well as exploring the islands in this chain that belong to the Nature Conservancy. Lee put the lifejacket on Gunnar and he didn't scream this time. I just about died laughing. 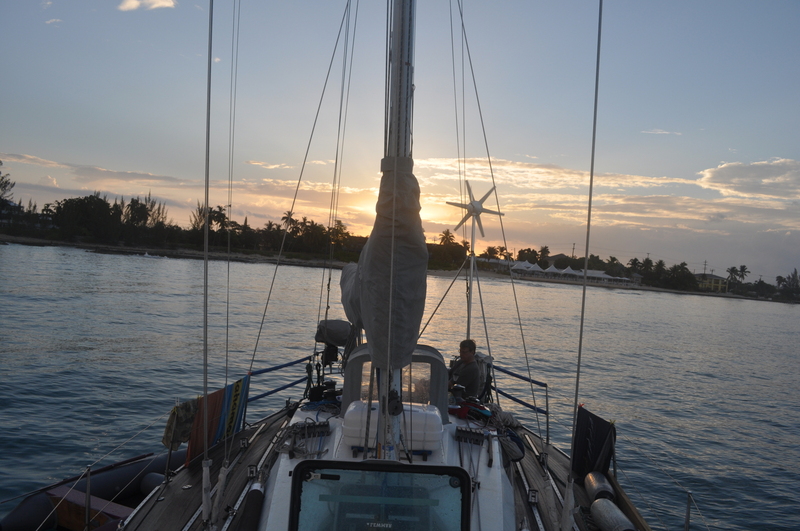 Monday was really just a test sail. Lee and I knew we were going down to New Hampshire for a family gathering on Wednesday but we really wanted to get out and get our feet wet first. I’m glad we did. 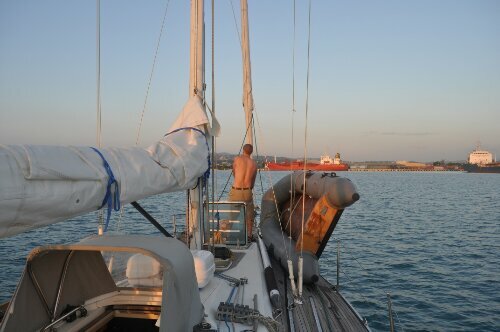 Our one night voyage was a good test of our Gunnar handling onboard as well as sleeping arrangements etc. The verdict? Co-sleeping in the v-berth is not ideal. Gunnar prefers to be oriented perpendicular to the direction we’re sailing. I still get seasick. Pirat is a pretty badass boat and Lee is an even better sailor than he was last year. Oh and Maine is great. Its the perfect temperature for us (right now). The scenery can’t be beat and the food is pretty tasty too. After our mini land hiatus we loaded the rest of our supplies this morning and left, for real this time, after lunch. Today destination was Hog island, just a few miles away from home base. Its an island we’ve always wanted to explore. I’m told the Audubon society owns it and people visit this lovely spot to watch birds. Tomorrow we’ll explore ashore before heading to our next destination…TBD for now although we have a list of possibilities including Matinicus, the most remote island in Maine with year-round residents, and Dix island. Pictures are refusing to upload so this is all you get. We did it! We’re off the mooring and on our way. We may have only gone a few miles down the coast but those few miles were the first test of whether this lis really going to work. The only pictures I took today were of the pile of stuff + baby down below before we left. 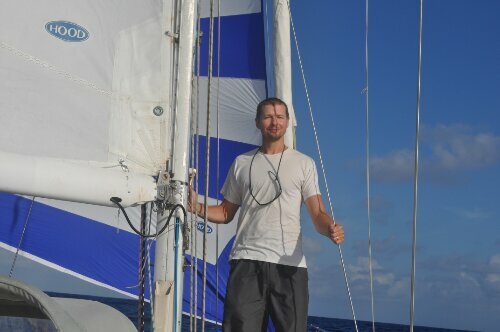 Lee did 99% of the sailing, which was a bit of an adjustment. I’m used to at least helping out with at least raising and lowering sails plus a tack here and there. This time I spent most of the sail below keeping G happy and trying not to puke. 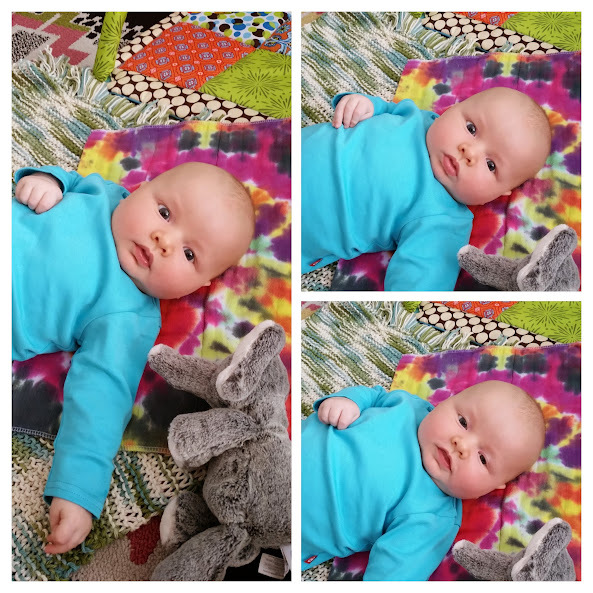 I was never really close to getting sick, as is typical with my seasickness, I just felt crummy most of the time : ( That made taking care of the baby rather challenging. Meanwhile, Lee was tacking Pirat upwind towards Pemaquid point. The boat sailed beautifully. I made it up on deck for just long enough to try out the new tiller and it was fabulous. I know I’ll enjoy steering a lot more now that it really feels like I’m driving a big dinghy. We pulled in to Pemaquid harbor at dinner time. I steered Pirat into the anchorage just like old times. This time, however, Gunnar oversaw things from his car seat in the stern. With the baby sleeping and the boat rocking, I’m ready for sleep myself. 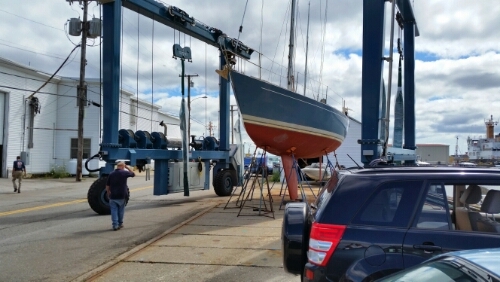 The boat is in the water and getting spruced up. I almost forgot what hard work scrubbing the deck is. 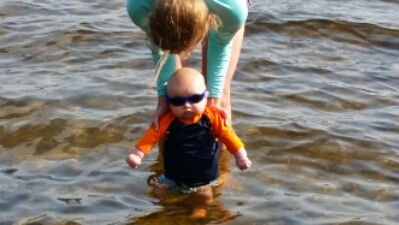 Gunnar is in the water too! I wish I could swim in this lake every day. It’s bathtub temperature and there’s a mini island to swim to. He had rather neutral feelings about the water - no tears but no smiles either. Gunnar also seems to be going through a growth spurt. Therefore, Lee and I have our hands full. The whole gang, minus Gunnar and me, will probably bring Pirat up to Bremen tomorrow. I’ll make a preliminary provisioning run. The boatyard tried to launch Pirat but realized she didn't have s helm before they put her in the water. We are hard at work getting Pirat ready to sail. I say we but really it’s Lee and his sister who are doing most of the work right now. Other than rounding up gear in the basement, making hurried trips to the marine electronics store,and delivering lunch, I’ve been hanging out at the grandparents’ house with Gunnar. Gunnar living the good life. Gunnar loves to look out at the trees and smile at his grandparents. For a resident of a state experiencing perpetual drought, Maine is a wonderful place to visit. It’s so wet here. It actually rains. I don’t even have to put lotion on when I get out of the shower. Everything is green green green! It’s lovely being at the house but I’m pretty excited to start our voyage. 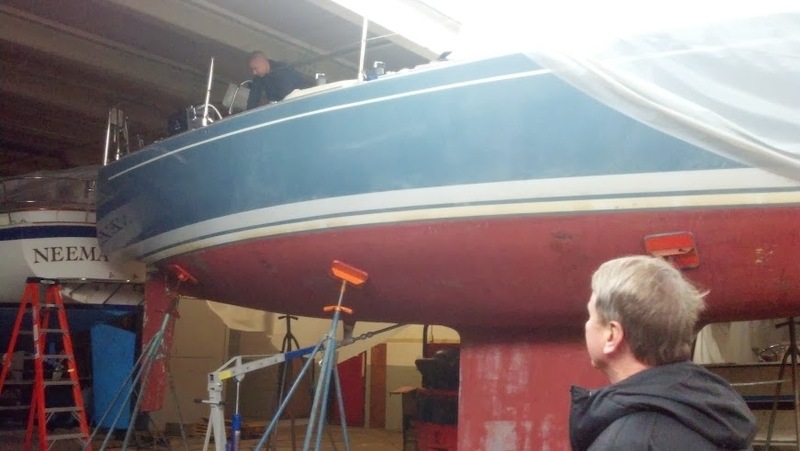 Pirat goes in the water tomorrow and then there’s a few more days of prep to do before we’re ready. If all goes well, we’ll set sail on Lee’s birthday. The baby is finally in bed (thank you time change!) so I’m headed there as well. I came across my my pictures from Maine last summer. Lee, his dad, and his sister sailed the last leg north from Plymouth MA and I flew out to meet them in Bremen. These pictures remind me how much I love summer in Maine. It’s not too too hot. The sunsets are beautiful. There’s lots of light in the evenings. Sure there are bugs and this CA girl has a tough time with the humidity but the lobster and the scenery are worth it. We’ll be there in 3 days! It’s a foggy July morning in San Francisco. I’m sitting at our dining room table with a steaming bowl of oatmeal and a generous mug of coffee, catching up with the world after an early morning trip to the gym. For a moment, the giant life changes of the past year are undetectable. This could be any non-work day morning from the past. Then I hear a whimper from the bedroom and smile, realizing my luxurious morning alone time is over. 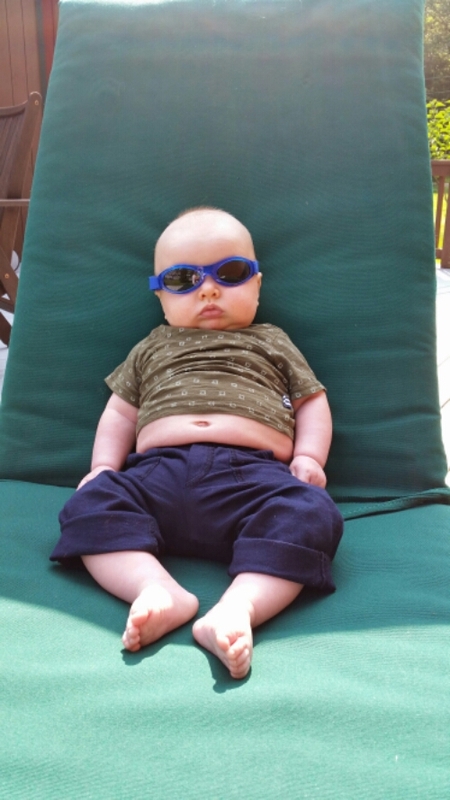 Life as a stay-at-home mom to our (almost) 3-month old must go on. The details, while important, aren’t essential to this story and I know the majority of people who actually read this blog already know that Lee and I welcomed our son Gunnar into this crazy world on May 4, 2014 (yes, Star Wars Day). My last blog entry covered part of Pirat’s return to the US, which Lee and I undertook in spring of 2013. 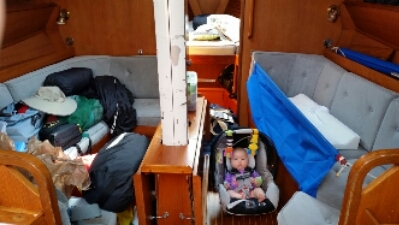 Thanks to helpful crew, Pirat and Lee made it safely to Maine that summer and we packed our boat away for storage in a cozy Rockland warehouse. At the time, we didn’t know when we would return to sail our beloved boat-home. 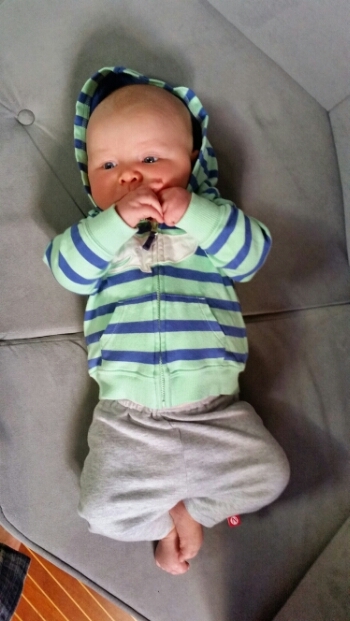 We hoped our next voyage might involve a new little crew member but that scenario was still a long ways off. Pirat in her winter home. While Pirat has been hibernating in her warehouse, Lee and I have been sailing my dad’s boat on San Francisco bay as well as racing Vanguard 15’s, International 110’s, and an occasional J-105. We have kept our skills sharp and even learned some new ones, as one can only do by sailing a variety of boats in different conditions. I think (I hope) Lee and I are ready for the challenge of sailing with an infant! There’s a baby down there. Gunnar has already been sailing on the bay a few times. We first ventured out when he was a week old and so far he has handled the boat really well. 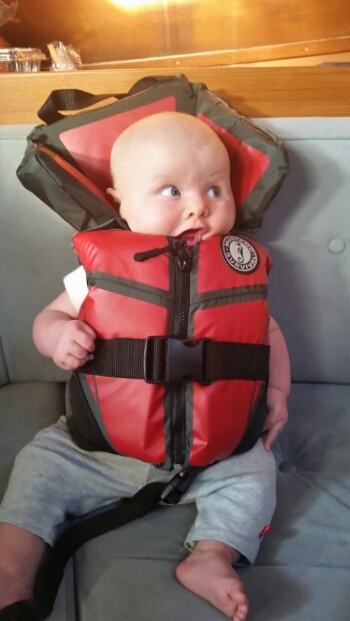 My dad’s boat has been great for accommodating a baby’s needs but Pirat will pose some additional challenges (I’ll get to those in another post). Before I get too carried away, here’s the loosely outlined plan for the next month: Lee, Gunnar and I fly back east in a few days. 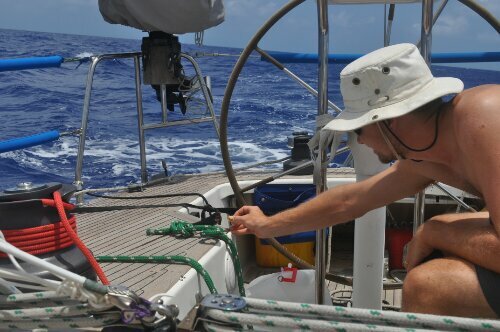 Lee will quickly prep Pirat for launching while I hang with the family and organize our stuff to bring onboard. 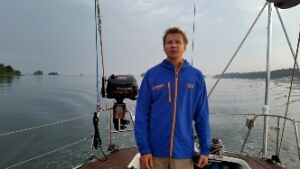 We’ll bring Pirat from Rockland to Bremen, a short day sail, and anchor in front of The Parents’ house to load up. 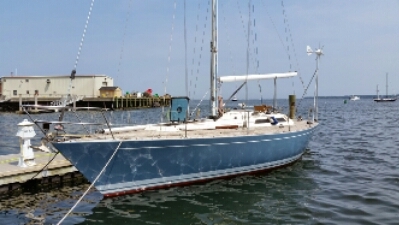 If all goes well, we’ll set sail some time in the first week of August and explore the Maine coast until we eventually reach Nova Scotia. We will have to allow enough time to make it back to Bremen by the end of the month, pack Pirat away again, and fly home. Wow. It’s taken me 3 days to write this post…that doesn’t bode well for regular writing on this expedition but I’ll do my best. I’m off to pack our bags for that Monday morning (6am, ugh) flight! Lee and Kurt arrived safely in Key West on Saturday night. I don’t know who was more relieved. Those boys made quite the passage and I’m very proud of them! I am also very, very glad I was nowhere near Pirat in those steep, wind-against-gulf stream seas. Yuck. I thought it might be fun to take a look at the back-and-forth between Lee and me on the Delorme. This is what we wrote to each other (in addition to a daily conversation on the sat phone). Lee’s status updates that he posted to the map are in bold. Keep in mind we had a 160 character limit so grammar and spelling was not a priority. I didn’t edit anything. I missed the dolphins. I love how they seem to be jumping down a wave that Pirat is on top of. Lee: Hey baby I call you from sea tomorrow. I’m ridiculously tired right now. Lee: The voice recorder if you can find it. That’s what it was. 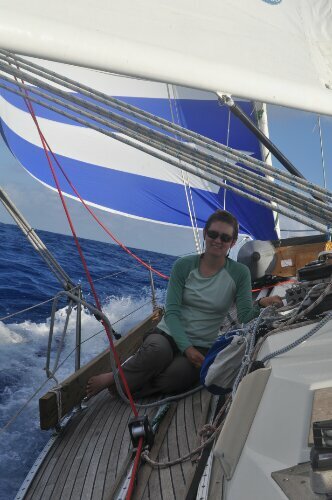 5 kts of wind from north , we’re close hauled it is pretty nice. Rachel: OK. Will have to get voice recorder tonight and send stuff tomorrow then. Still only found radar cable. That does sound nice! I’m at work now:( Love you! Lee: Do you know where my toilet kit is? I’m tired. Rachel: nope. take a little nap then. can’t find the voice recorder. where would it be? our toothbrush died. it won’t turn on : ( I don’t know how to reset your clock. Rachel: Email better. Can’t find the recorder. might not get to mail package till tomorrow but will make sure it gets there in time. how are things? are you well fed? Lee: Hot hot hot. Maybe check brown basket on desk with pens. I am eating food. It is not fun to prepare. Slow sailing. I want to go for a swim. Lee: Plenty of ice where’s the coke? I don’t really have any charts for Cuba though. How many miles until it isn’t too hot? Rachel: Coke in center of after cabin with canned wieners. believe it or not, it’s hot in sf right now too! going to mail package this afternoon. got enough to read? Now hot and windy instead of just hot. 24 mm contiguous zone around cuba? Anyone want to confirm this? I was planning on going in tight. Key West. Rachel: my dad emailed saying he was worried about you going so close to cuba. wow you are awfully close. call again same time tonight. you are round the bend now! Rachel: oh honey, it must be bad if you say its bad. how was heaving to? too bad cuba is cuba. are chainplates leaking? how big are the waves? break out bpack food yet? Rachel: honey, where are you going?? is everything okay? on lunch so you could call me. The sea is a harsh mistress. Plodding along with storm jib. Wind only 15-20 kts seas not too big but Pirat-killers none the less. Lee: Yeah fine, just annoying. maybe search rtofs Atlantic and global and check the graphics and see if you can correlate. Lots of time we played some rummy. Hoping to catch the gulf stream. Right now 1-2 kts unfavorable current plus close hauled. Can someone check nowcoast and describe the current current? Rachel: nowcoast is down. is the boat holding up ok? are you guys holding up ok? i cannot concentrate on work – watching the tracker instead! now I know how dad feels! Rachel: Did you run out of batteries? things still going better on this tack? is my gym membership frozen for the rest of the month? did you find the backpacking food? Things looking better now.Still not sure if we’re in the stream yet.Feeling optimistic that we’re not going to be stuck in the gulf of mexico forever. Hove to, slept a few hours, then spent rest of night helming in short period crazy seas up to maybe 14 ft. Now going back for some more stream action. Lee: Could you call conch harbor marina and let them know we are coming in late afternoon-evening and reply me the details? Boat is a mess. Stupid chain plates. This picture makes me dizzy. That is the sandy, coral-studded bottom you see 15 feet down. I’m home? Really? It felt so, so strange to come home to an empty house last night. The lights all came on when I flipped all the circuit breakers (yes, Lee, I remembered to turn up the water heater too). Even Doc was confused. There was running water. I actually slept underneath something – a comforter. There was a pile of mail in the garage. I ate Cheerios with chocolate almond milk for dinner. I plugged in my cell phone before going to bed. Everything feels extra strange without Lee. The idea that he might not come home for another two months is disturbing. I’m glad I had today to readjust to this world before returning to work tomorrow. I will be back. There is more to tell and I might not be able to resist writing about Lee’s continuing travels, even though I’m not there. 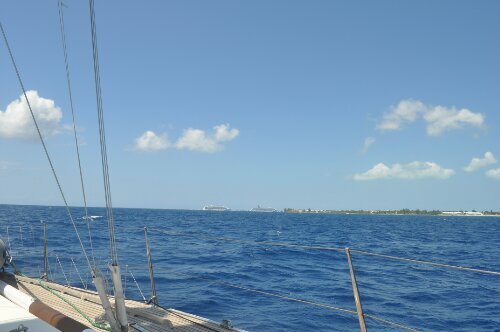 I was so, so ready for the passage to be over when Lee and I finally made it to Grand Cayman yesterday afternoon. It had taken us longer than we’d hoped to get here and the sun, heat, and thwomping sails as we rolled downwind had gotten really old. That said, I did try to savor my last hours at sea on Pirat for the time being, especially at night. When things are relatively calm, warm, and its not too hard to stay awake, night watches really are my favorite time. It’s so peaceful. There are so many stars and so few sounds other than the boat creaking and the waves swooshing. Lee and I both had a tough time staying awake on our watches this time. I think the journey is starting to wear on us. 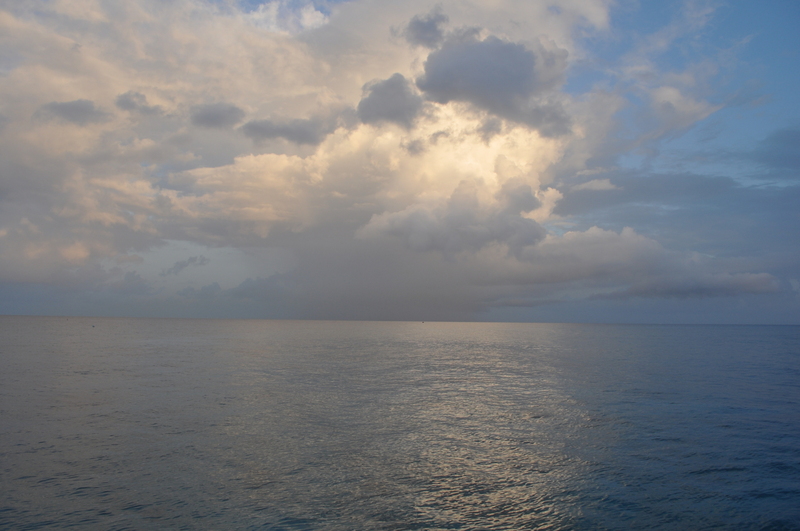 The sail from Jamaica to Grand Cayman brought some new experiences. 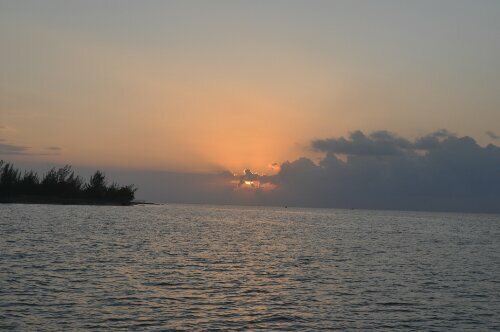 We left Montego Bay at dusk, happy to leave the busyness of land for a few days. There was a sizable fire in the hills and it rained ash on us as we headed out to sea. I guess it was sometime the next morning when the bird showed up. It came with several others like it – small, dark brown birds with yellowish breasts. They swooped around the boat, which was well out of sight of land at this point. 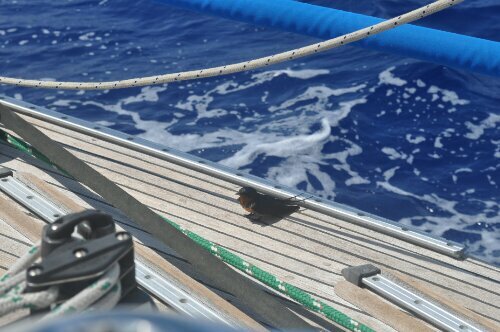 All the birds moved on but one, who swooped down to land on Pirate’s foredeck. It stayed there for a while before taking off, flying a little ways away from the boat, and then landing on Pirat again. This went on all day with the little bird landing in different places on deck each time. It perched on the lifelines, the jib sheet, and right on the deck. It wasn’t scared of Lee and me and got quite close to us. Occasionally it let out a few little chirps. I was pretty sure the bird was going to die. It was either too weak to make it back to land or really smart and just wanted a free ride to a new island. The bird seemed to be getting weaker as the day went on. Then, after dinner, another guest arrived! A second bird of the same type landed on the jack line right under the wheel. The original bird had sequestered itself to the aft part of the cockpit where we keep a spare diesel can and the propane tank. It was clearly on its way out. The second bird fluffed up its feathers, chirped at us a little, and rested on the jack line all night. Lee gave our original little stow-away a burial at sea in the morning. The night time passenger left in a rush and flew off towards Little Cayman. Those birds provided us with hours of entertainment. When I wasn’t watching them, I was finishing one book and starting another. I read all of Gabriel Garcia Marquez’s Story of a Shipwrecked Sailor during the second night and last day. That wasn’t the best thing to be reading as we sailed through a nearby part of the Caribbean to where the story takes place. 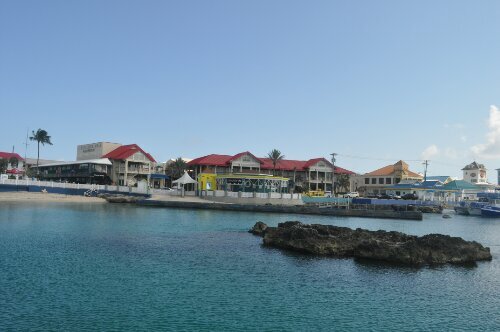 Grand Cayman is very different from what we expected, although it does live up to Lee’s expectations as far as clear water is concerned. After docking against a very sketchy cement pier to check in with customs and immigration, we headed out to one of the free moorings overseen by the Port of Georgetown. Our mooring is in 20 feet of crystal-clear water – some of the clearest we’ve seen – with rocks, coral, and fish shimmering beneath us. I don’t usually like to snorkel but as soon as I got in the water and got over the initial feeling of euphoria that cool water gives, I just wanted to swim and swim and never stop. It felt to good to move and not be hot. 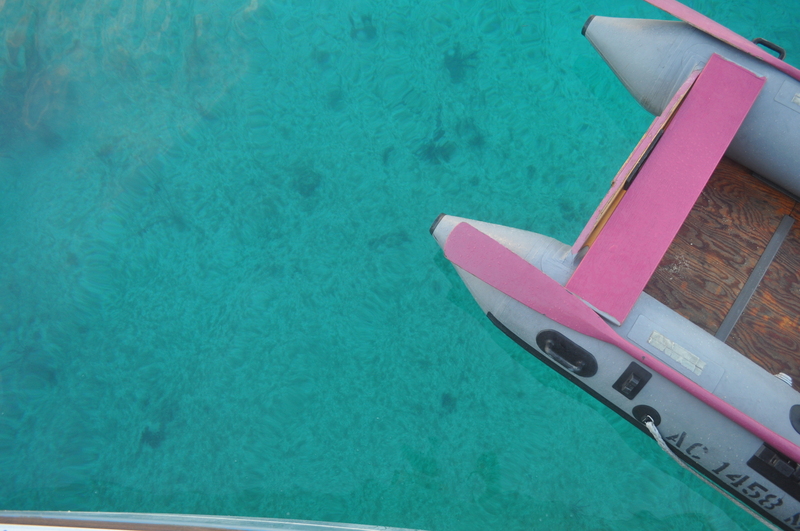 I dove down to check out the sights underwater and swam laps around the boat. It was wonderful. I found myself wishing I wasn’t leaving in a couple of days. I am leaving, though. Tomorrow I fly home to SF so today I’m trying to put things in order on the boat, pack my bags, and enjoy my last few hours in paradise. Lee’s dad arrived today. Lee is meeting him at then airport while I write this post in a laundromat.